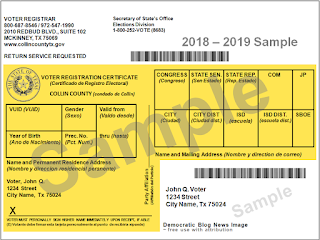 The Early Voting period is now over for the Texas primary elections , but if you missed the opportunity to cast your vote during that period, you have a final opportunity to make your voice heard and weigh in on who should be on the general election ballot on March 6, which is primary Election Day. And Texas Democrats are feeling giddy as that day approaches. There were according to the Texas Secretary of State's office 885, 574 Texans in the Lone Star State's 15 largest counties who participated in early voting either by mail or in person. That smashed the record for a non presidential election cycle. The increase in Democratic turnout is fueling hopes that this may translate to a blue Democratic wave of voting in November. That new participation record was powered largely by a huge surge in Democratic voters, who doubled their participation numbers from the dismal 2014 cycle. 465,245 Democrats had voted during the early voting phase vs just 420, 329 Republicans. Republican turnout was up 15%, but was dwarfed by the 50% increase of Democrats. The early voting numbers would probably be even higher if the Republicans hadn't cut out the last weekend of early voting before Election Day. Here's are my TransGriot endorsements to help you out along with the endorsements of other organizations like the Houston GLBT Caucus, to help you cast an informed Democratic primary vote. I'm not a fan of the Republican Party in large part because of the rabod transphobia, anti-woman attitudes and anti-Blackness , and that's why I don't do endorsements for GOP candidates. Polls open at 7 AM and close at 7 PM If you are in line at 7 PM to vote, DO NOT get out of line. The polling place must stay open until all persons in line have cast their ballots. Good luck to all my endorsed candidates, and hope you make it to the November ballot. Already? Time To Spring Forward 2018! 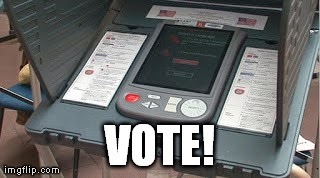 It's TX Primary Election Day!